Art and finance coalesce in the elite world of fine art collecting and investing. Investors and collectors can’t protect and profit from their collections without grappling with a range of complex issues like risk, insurance, restoration, and conservation. 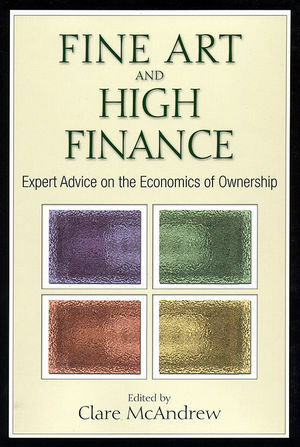 They require intimate knowledge not only of art but also of finance. Clare McAndrew has a PhD in economics and is the author of The Art Economy. She is considered a leading expert on the economics of art ownership. Dr. Clare McAndrew is a cultural economist, investment analyst, and published author. Clare completed her PhD in economics at Trinity College Dublin in 2001, where she also lectured and taught economics for four years. She then led a number of research projects for the Arts Council of the U.K., publishing studies on the effects of regulation, taxation and other issues in the visual arts market. In 2002, Clare joined U.S. firm Kusin & Company, a boutique investment banking firm specializing in art investment, as chief economist where she worked for three years. She returned to Ireland in 2005, and continued her work in the art market in a private consulting capacity with a global client base. Clare founded Arts Economics in 2007 to focus her efforts on art market research and analysis, and works with a network of private consultants and academic researchers in providing research and consulting services to the global art trade and financial sector. 1 An Introduction to Art and Finance (Dr. Clare McAndrew). 2 Art Appraisals, Prices, and Valuations (Elizabeth von Habsburg and Rachel Goodman, Gurr Johns; and Dr. Clare McAndrew). How, where, and when people buy art and what they do with it. The economics of the art market: supply, demand, and price determination. Valuation and appraisal issues; art as a financial asset; quantitative and qualitative issues. 3 Art Price Indices (Dr. Roman Kräussl). Investment returns to art; assessment of performance between assets and over time. Art price indices—methods and debates. 4 Art Risk (Dr. Clare McAndrew and Dr. Rachel Campbell). 5 Art Banking (Suzanne Gyorgy, Citi; and Dr. Clare McAndrew). Art as collateral and downside risk. Art lending: history and current practices. Art financing solutions: comparative review of banks, auction houses, galleries, and others. The future of art banking. 6 Art Funds (Jeremy Eckstein, Randall Willette, and Dr. Clare McAndrew). Art funds: history and motivations. Art funds today: different methods and approaches. Strategies: sector allocation, opportunity funds, and hedge funds. 7 The Government and the Art Trade (Dr. Clare McAndrew; Rena Neville, Sotheby's NY; Anthony Browne, BAMF). Role of the government in the art market. Art and the national patrimony. Trade restrictions and investment issues. U.S. relationship between art and government. U.K. relationship between art and government. 8 Insurance and the Art Market (Christiane Fischer and Jill Arnold, AXA). Art as a real asset: risk issues and the insurance market. Insurance and the art market: history, practice, and methods. Art appraisal and valuation issues. 9 Art and Taxation in the United States (Ralph E. Lerner, Withers). Tax and the art market: global investment and the tax nexus. Transferring wealth: capital gains and inheritance tax. Estate planning and the legal implications of inheriting, selling, and bequeathing art; divorce situations; prenuptial agreements; division among heirs. 10 Art and Taxation in the United Kingdom and Beyond (Pierre Valentin, Philip Munro, and Samantha Morgan, Withers). Direct taxes: income tax, capital gains tax and corporate tax. 11 Art Conservation and Restoration (Barbara A. Ramsay and John K. Jacobs, Artex). Conservation versus restoration versus preservation. 12 The Illegal Art Trade (Charles T. Danziger and Thomas C. Danziger). The black and grey markets for works of art. Illegal import and export, repatriation, export licensing, and the national patrimony. Art theft and stolen art: issues and anecdotes. The global movement of works of art: legal and illegal, repatriation, art and conflict.